This is a collection of films Recorded by steam enthusiasts during the 1950’s and 60’s, who set out to record the sights and sounds of steam at work on the railways back at that time. It features some interesting lines, including The Waverly cross-border Route to Scotland, The North East, featuring coal trains around the Sunderland Area, The East Coast Mainline featuring Kings Cross & Knebworth. Worcester to Paddington which looking at the work involved in an Express Passenger Train bound for London. The South East which features atmospheric action at Red Hill, The Somerset & Dorset Joint Railway and the North West which features mainline journeys through the beautiful Westmorland Countryside as well as Banking over Shap. This DVD features more films Recorded by steam enthusiasts during the 1950’s and 60’s, and includes Kings & Castles on the Main Line, Stanier Pacifics on the West Coast Main Line, LNER Passenger & Frieght engines on the East Coast Main Line Bulleid Pacifics working on the Southern Region and Britannias at Liverpool Street Station, plus many more. This DVD looks at the efforts of many Dedicated enthusiasts to set up Heritage Lines all over Britain and save these magnificent machines from scrapping, in order to allow future generations to enjoy the nostalgic sights smells and sounds of a working Steam Line. Had it not been for these people, these would have been lost many years ago. The DVD features some of the Best known Heritage lines, Including “The Bluebell Railway” which runs nine miles through some very attractive scenery. The North York Moors Railway from Grosmont to Pickering which also features beautiful scenery. The West Somerset Railway which provides a useful service to and from Minehead, and is home to the Awesome SDJR 88 (53808), and the East Lancashire Railway which travels through The Pennines from Bury to Ravenstall. I have recently watched this brilliant DVD again, it looks at some of the locomotives which were originally built by the Big Four railway companies – Great Western, Southern, London Midland Scottish and London North Eastern Railway, which have survived into preservation and have found a new lease of life running on preserved railways throughout Britain. It includes Mighty Merchant Navy and West Country Class Pacific locomotives which worked on the Southern Region, such as Taw Valley, which now work on lines such as the Bluebell, Great Central, North York Moors, Keighley & Worth, Severn Valley & Swanage Railways. 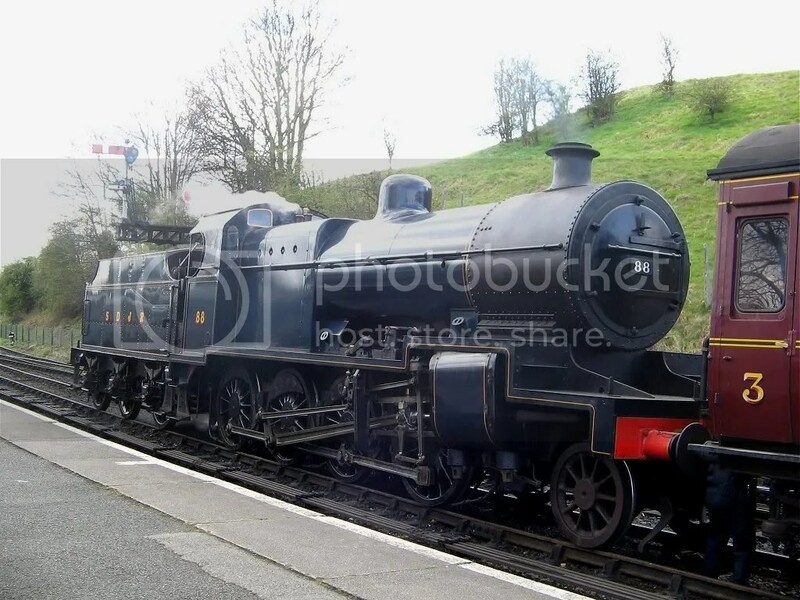 (Although Taw Valley itself is currently having an overhaul down at the SVR at the moment) and also the Maunsell designed Sir Lamiel & King Arthur which can still be seen working. The DVD also includes members of the Great Western Railway fleet such as Castles, Halls, Manors and the Incredible King Edward I which still operate all over the place including The West Somerset, Llangollen & Severn Valley Railways , in fact King Edward II is due to come to the Severn Valley Railway for the Autumn Steam Gala in September. Manors such as Bradley Manor Foxcote Manor, Erlestoke Manor, Cookham Manor, Ditcheat Manor and Odney Manor also feature in the DVD. Hinton Manor is currently on static display at Swindon. There are also War Department & BR designs featured, such as LMR600 Gordon & Mighty BR Tank Engines such as the 82045 which is currently being built down at the SVR., These were the ultimate development of Engines such as GWR 4566 which is also featured & can currently be seen working on the SVR.